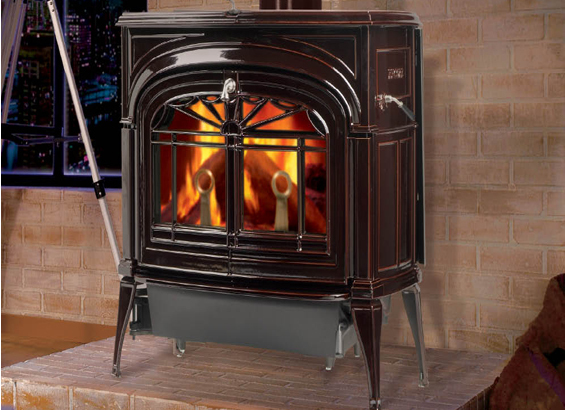 Unlike any other wood stove on the market today, the Defiant® adapts to your lifestyle, letting you choose to operate in catalytic or non-catalytic mode, based on your preference. Two-In-One Combustion SystemVERMONT CASTINGS EXCLUSIVE! More flexibility with two ways to heat —Converts from catalytic to non-catalytic operation in less than one minute! Eco-Friendly DesignMade green — Our stoves are made from 100% recycled materials and production processes use renewable energy. High Efficiency OperationSave money while heating your home — More heat from less wood means savings of up to $300 or more during an average New England winter and up to $1,400 in fuel costs. * *When used in catalytic mode over 5 years. Top Load DesignEnjoy longer burn times — Fills to nearly 100% of its capacity so you don’t have to load as often. Easy MaintenanceVERMONT CASTINGS EXCLUSIVE! Easy to clean and maintain — Easy access to the catalyst and combustion chamber without the use of any tools. Thermostatic Air ControlVERMONT CASTINGS EXCLUSIVE! in Non-Catalytic Mode — Your stove won’t overwork and you’ll enjoy longer, more even burn temperatures in catalytic and (for the first time) in non-catalytic mode! Limited Lifetime WarrantyGuaranteed to last — Vermont Castings boasts the most comprehensive warranty in the industry with a Limited Lifetime Warranty on all castings, combustion systems and door glass. Hand-Crafted DetailsThe traditional beauty of hand-crafted cast iron is our passion. We’re committed to delivering a beautiful product that you can proudly showcase in your home. 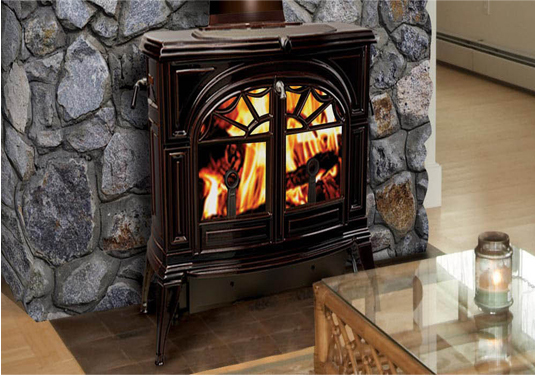 Two-In-One Combustion SystemVERMONT CASTINGS EXCLUSIVE! More flexibility with two ways to heat — Converts from catalytic to non-catalytic operation in less than one minute! Eco-Friendly DesignMade green — Our stoves are made from 100% recycled materials, and production processes use renewable energy. 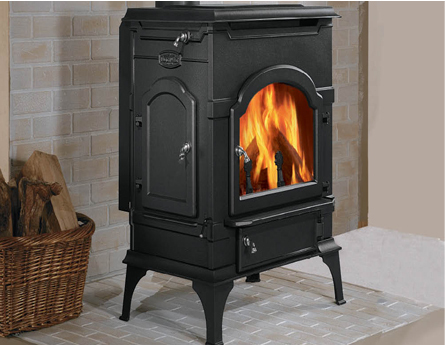 Compact DesignPerfect for small areas — The smallest of our non-catalytic wood stoves, the Aspen offers the benefits of a larger stove in a smaller, more compact package. Radiant HeatingGreat heating results for its size — The I.R.-Coated Ceramic Glass provides warm, radiant heat. Top Plate Cooking SurfaceForm and function — Provides a classic look and a convenient place to warm food items like bread. EVERBURN Combustion SystemStable, long-burning flame — This highly efficient non-catalytic combustion system reaches emissions levels as low as comparable catalytic models, as little as 1.31 grams per hour! Leg LevelersConvenient installation — Install your stove even on rough, non-level surfaces with these adaptable leg levelers. Insulated Refractory Brick FireboxKeeps heat in and cold out — The firebox is completely insulated to keep cold air out, and its refractory lining helps distribute heat back into the room. 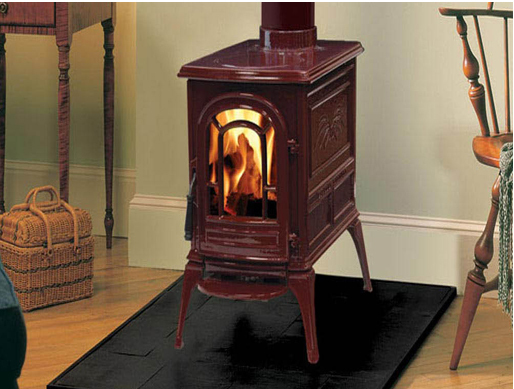 Front and Side LoadingSafe and easy log loading — Load this stove with wood from the side or the front as needed, whichever side is easier to access.